CBS News anchor Katie Couric conducted a wide ranging interview of US Treasury Secretary Timothy Geithner while he was in London for the G20 meetings. Of course, we want to hear what the Secretary has to say about his plan to deal with the global financial crisis but it’s also interesting and instructive to watch this video through the lens of how a leader communicates. Let’s face it, this man has voluntarily signed on to help straighten out a monumental mess; I can only think of one job today that might be more demanding and that’s the one his boss holds. These observations are not meant to be critical, but rather to demonstrate the different approaches to leadership communications and how they may impact the message. Our human nature unfortunately causes us to look to our leaders to solve our problems, and therefore, expectations are created. The ability to balance these expectations yet remain authentic is one of the greatest challenges of leadership. One of the reasons that Secretary Geithner had a rough start in the media is due to the way he communicates. There is little doubt that he is a smart, serious and dedicated individual but being at the center of the financial crisis causes all eyes to fall on him and this appears to be a part of the job with which he’s not totally comfortable. 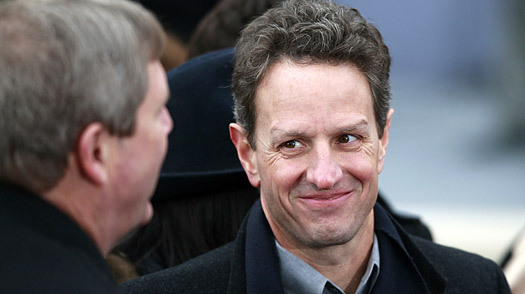 In contrast to President Obama, Geithner speaks in a rapid-fire cadence, only occasionally offers an uneasy smile and never uses humor, stories or personal anecdotes during the interview. When Couric asks a direct or more confrontational question, he has a deer in the headlights look that has nearly become his trademark. His youthful appearance, in contrast to that of his predecessor, Henry Paulson, creates a greater need for him to project confidence and trust in these situations. There a few quick and easy things he could do to become a more effective communicator while still maintaining his authentic leadership style. First, slooooow the delivery way down. It’s guaranteed that the interviewer will give him as much time as he needs to get his point across and the challenges of the job will still be there when he’s done with the interview. Second, smile more often. Now we don’t want him to look like a used car, insurance or snake-oil salesman, but an occasional smile is a welcoming signal that can cause an audience to be much more receptive to the message. Third, be more engaging. Despite the fact that Geithner is currently one of the most powerful men in the world, during the interview Couric was in complete control. This was due in large part to Geithner simply answering her questions rather than offering anything back for exchange. His interviews often come off more like interrogations than anything else. Let the audience know a little more about who Timothy Geithner is and they will probably be able to take in what he is saying more readily. Here’s an excerpt from a March 22, 2009 President Obama did with Steve Kroft for 60 Minutes which draws a sharp contrast to Geithner/Couric above. Obama is a masterful communicator from which Geithner and the rest of us can learn. The real question is: As a leader, do you communicate more like Geithner or Obama? Tagged with CBS, communications, President Barack Obama, Timothy Geithner.